Right there, in October last year, the smartphone finally eclipsed the feature phone. This is something that every data provider in the mobile sector has been screaming about for quite a while now – the upcoming mobile data ‘apocalypse’. A mere three or four smartphones can generate enough data to swamp an exchange from only a few years ago; the only reason networks like AT&T’s haven’t been falling over more often than they have been is a lot of fairly rapid work on the part of the technical teams in charge of the backhaul for their networks. But the rise in the demand for mobile data, as game-changing as it has been, is only just getting started, and this report points that out. 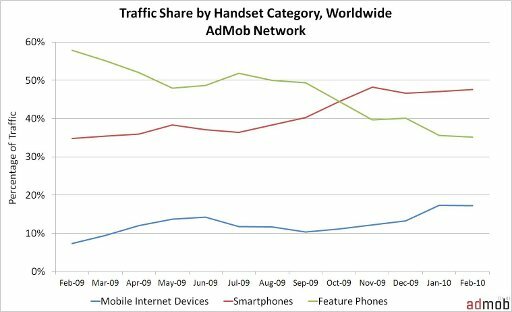 Ignore for a moment the swapping of places between the smartphone and the feature phone — look at the growth rates of demand for smartphones and the third category of device – the mobile internet device (currently this is predominantly – ie. 93% – the iPod Touch). This category’s demand for data from the Mobile Network Operators has seen growth of almost 400% compared to the 193% of smartphones. But surely that has to top out, right? What could possibly maintain that level of growth? Yup. When the iPad debuts, it’s going to be in this sector. 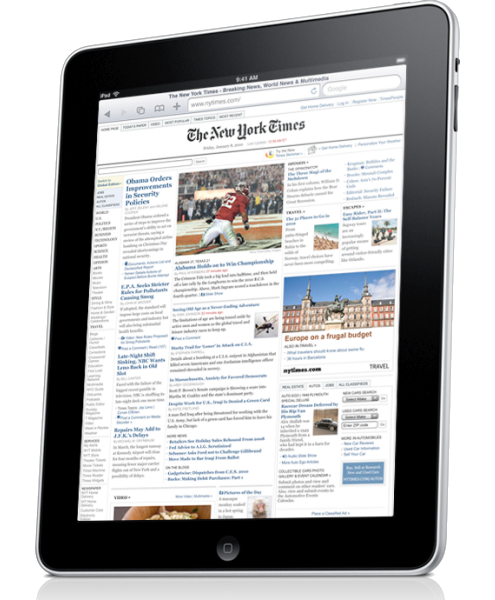 And it’s a content consumption device almost by default – newspapers, youtube, you name it. Granted, only the more expensive model has 3G, but you know that’s not going to last – Apple has a pattern with their hardware which tells us that however slick the iPad is today, it’s only going to be refined and become more compelling as a device. And meanwhile the iPad clones like the JooJoo which will get to customers even before the iPad, will only add to the increase in growth rate that the iPad is going to drive. And LTE isn’t going to save things. Ericsson’s latest figures indicate a 1000-fold increase in over-the-air capacity is needed and LTE will only offer around a 10-fold increase. To make up the 1000-fold, plans include introducing LTE in combination with taking over more spectrum, building nearly ten times as many basestations for cell towers as exist today, and three or four other impossible things before breakfast. And even if the MNOs can pull all that off, you still have to have backhaul to attach to that over-the-air network. But it cost $16 billion for last year’s backhaul in the US alone. Next Post: Continuing Professional Development – does your company do enough for you?